What can you do when the grouchies take hold? How can you keep a bad mood at bay? With funny rhymes and a silly chant, The Grouchies shows kids simple and fun ways to turn around grouchy moods. But most of all, kids will understand how their mood and negativity can affect their family and friends, and really get in the way of having a good day. An extensive Note to Parents further explains the child's experience and provides parents with easy-to-apply tips and tools for helping their kids when a grumpy day comes along. Everyone feels grouchy sometimes. Young children, as well as adults, are capable of an array of moods that can influence the ways in which situations are interpreted and the actions of other people are perceived. So a grouchy mood can negatively affect how you think or feel about anyone or anything. Grouchiness can be contagious, since people tend to mirror or "catch" the moods of those around them. Thus, a child's mood can be influenced by the negative disposition of a caregiver. Similarly, a negative mood in a young child can be so powerful that everyone in the house may feel it. Debbie Wagenbach grew up on a farm in southeast Iowa, the oldest of nine siblings. She has been reading and telling stories to children for as long as she can remember. As a retired children's librarian, she now writes books for children herself, mostly during the daylight hours. Debbie still lives on the same farm, where she enjoys quiet strolls on dusty roads, cloud watching, savoring a daily smidge of dark chocolate, and introducing her great nieces and nephews to the loveliest of books. She is the author of The Grouchiesi and Big, Bad, Brave Sergio. 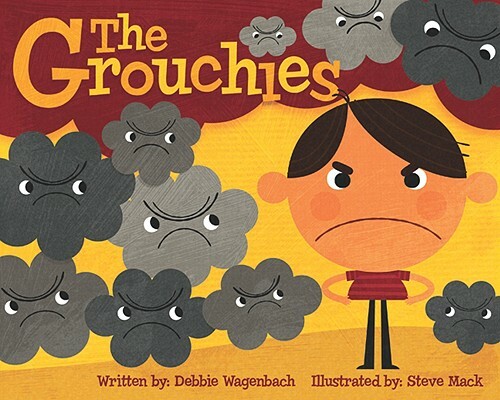 Visit her at www.grouchies.com and follow her on Facebook: @DebbieWagenbachChildrensAuthor and Twitter: @Deb_Wagenbach. Steve Mack is a freelance illustrator and has been illustrating professionally for the last decade. Steve has recently returned to Canada and his freelancing roots and now works for many clients. He has a small studio on a farm in the valley and lives with his wife and two small children. His children's books include Stickley Makes a Mistake, Peanut Butter & Jellyous...sometimes friendships get sticky, and The Grouchies. Visit him at www.stevemack.com or follow him on Facebook: @SteveMackIllustrator, Twitter: @steve_mack or Instagram @SteveMackIllustrator.